Sodium butyrate is a molecule that is well known for its ability to elicit many effects at the cellular or microbiological level in several tissues. For example, it can be used as an energy source by epithelial cells lining the intestinal tract, reduce production of pro-inflammatory cytokines and induce the production of enteric hormones. Many of these effects are related to an increased health status of the gastro-intestinal tract (GIT), thereby supporting the use of butyrate as performance enhancing supplement in the feed of production animals. Several different cell types along the GIT are responsive to butyrate, suggesting that a wide range of butyrate-dependent effects are triggered if this molecule is delivered throughout the entire GIT. Butyrate however is a small molecule that is easily absorbed and metabolized in the first part of the digestive tract, the stomach. Therefore if butyrate is not adequately protected from gastric absorption it will not be able to elicit all the desired effects associated with direct delivery to the lumen of the more distal GIT regions. Two main approaches have been developed to tackle the challenge of enteric butyrate delivery: the coating of butyrate and the use of butyrate derivatives such as butyrins. Coated products are typically composed of beads containing butyrate that is embedded in a protective matrix of vegetable fat. The rationale behind this protection is that a significant part of the butyrate content will only be released from the moment lipase is secreted in the duodenum, breaking down the lipid matrix. Mono-, di- and tributyrins, on the other hand, are composed of a glycerol backbone to which one, two or three butyrate units are bound, respectively. As the bonds on the outside end of glycerol can be cleaved off by lipase, it is hypothesized that these molecules have an inherent capacity to enterically release butyrate (Figure 1). Research data however on the metabolism of short-chain glycerides (such as tributyrin) in poultry and other production animals is scarce, leaving uncertainty over the validity of this assumption. Figure 1: Proposed butyrate release mechanism of ADIMIX®Precision, a target release coated butyrate (A) and butyrate glycerides, such as tributyrin (B). Butyrate is represented as orange dots (in A) or rectangles (in B), while the fat coating (A) and the glycerol backbone (B) are depicted in blue. 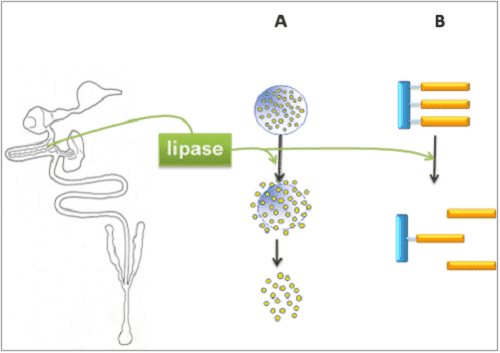 Lipase, secreted by the pancreas, will break down the protective fat matrix of coated butyrate, and two butyrate side chains of tributyrin. Both mechanisms are proposed to result in a gradual butyrate release in the intestine. Therefore Nutriad set up experiments to explore in more detail the potential of these butyrate products to deliver butyrate throughout the entire GIT of broilers. More specifically, we assessed their butyrate release profiles using in vitro incubation assays as well as in vivo studies. In Nutriad’s lab in Belgium we incubated several test products in solutions simulating the conditions within the GIT, based on the protocol of Boisen & Fernández (1997). We analyzed pure and uncoated sodium butyrate, a coated butyrate product (ADIMIX®Precision) and a tributyrin product. Results indicated that, as expected, uncoated butyrate was nearly completely converted to and detected as butyric acid in the gastric phase, eliminating the need to have it analyzed for subsequent intestinal release. ADIMIX®Precision, on the other hand, released about 36% of its 30% butyrate content in the gastric step, while the rest was set free during intestinal incubation. values between brackets point to a limitation in the experimental set up. See text for details. Table 1: In vitro butyrate analysis results of three products, uncoated butyrate, a coated butyrate product (ADIMIX®Precision) and tributyrin. The release of butyrate after incubation is expressed as a percentage of the experimentally detected total butyrate content. See text for details. During the analysis of tributyrin, lipid droplets were observed on the surface on mixtures after incubation, and low values were detected, not only after gastric/intestinal incubation but also in the total butyrate recovery assay, suggesting that the current experimental setup was not suited for this type of butyrate product. This prompted us to have the tributyrin product further analyzed at the University of Wageningen (the Netherlands), where a protocol was optimized using different concentrations of pancreatin, bile acids, tributyrin and buffer concentrations in order to find the conditions mimicking the digestive tract environment of poultry as closely as possible. Using this assay, between 1% and 7% of butyrate could be recovered following gastric incubation of tributyrin. After the intestinal step, we could only detect a maximum butyrate yield of 35%, while we expected it to be 66%, given that pancreatic lipase is described to preferentially cleave the ester bond of the first and third butyrate side chain, leaving the chain in the second position intact (Brockerhoff, 2012). 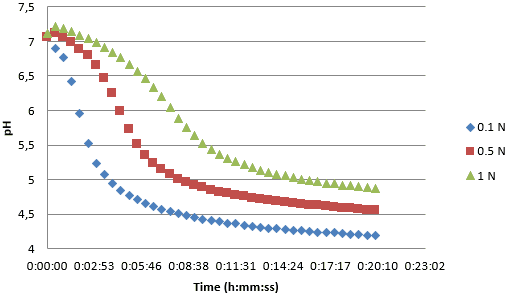 We found that this was due to a rapid decrease of pH, caused by the release of butyric acid during hydrolysis (Figure 2), which drastically reduced the activity of the lipase in this assay. Although the pH dynamics of the experiment prevented tracking of the butyrate release kinetics until the complete hydrolysis of tributryin, the fast pH-drop suggests that butyric acid is very quickly released once pancreatic lipase is secreted into the digestive tract. This is in disagreement with a model describing a slow and sustained release of butyrate up to the hindgut. To test this hypothesis and to further investigate the butyrate release profiles of uncoated butyrate, ADIMIX®Precision and tributryin in vivo, we set up an experiment at Ghent University (Belgium), supplementing broilers with the different butyrate products during day 21-28 of age. On day 28, the birds were euthanized and digesta samples were collected and analyzed (Figure 3). We could demonstrate that the intestinal butyrate levels of broilers fed ADIMIX®Precision were significantly higher in the proximal part of the intestine (duodenum) as well as in the hindgut (caecum) compared to the negative control and the uncoated butyrate groups. The data for the tributyrin suggest that this product already releases all its butyrate content in the duodenum, preventing butyrate delivery more distally in the intestine. Of note, it can be assumed that monoglycerides of short- and medium-chain fatty acids, such as monobutyrin, will be cleaved by lipase just as easily. This is important in light of their potential antibacterial effect, which has been documented to be higher than that of free fatty acids using in vitro assays. As our data however suggest that pancreatic lipase will immediately cleave these molecules early in the duodenum, it is unlikely that they have a significant impact on intestinal bacteria in vivo. Figure 4: Summary of poultry GIT regions where butyrate is predicted to be released by uncoated butyrate, ADIMIX®Precision, and by tributyrin, based on the in vitro and in vivo trial results. In summary, with in vitro and in vivo experiments, we were able to show that the three products under evaluation had different butyrate release profiles: our data are in line with a gastric absorption of uncoated butyrate, while tributyrin is most likely to liberate butyric acid in the very first part of the small intestine. ADIMIX®Precision, on the other hand, was able to deliver butyrate in the stomach as well as the proximal and distal regions of the chicken GIT. We therefore argue that only ADIMIX®Precision has the potential to trigger beneficial butyrate-dependent effects throughout the entire digestive tract in poultry.